Some say it's the Jesuits, others claim Karl Marx. Who knows who said it first? It's actually the kind of line you can attribute to just about anyone, whether that "anyone" is thoroughly despised or blessedly loved. "Give me a child until he is seven, and I'll give you a man." I don't know that anyone knows for sure who said it first, but today everybody does. Willa Cather claimed that "most of the material a writer works with is acquired before the age of fifteen," a maxim I've always thought on the money--and, of course, it's helpful in reading Nebraska's great early 20th century novelist, who left the her beloved red plains when she graduated from college but never really departed at all. Her most memorable novels are set right there where she spent her first 15 years. Something gets in us early on, something that doesn't leave--that's the upshot. My granddaughter called me last night to ask me some questions for a story she has to write. She's in fifth grade now, has her first male teacher, which (who) she likes. "Grandpa," she said, "what was school like when you were a boy?" I mumbled through an answer, nostalgia about as far away as the foothills of the Rockies. "Who was your best friend?" "What did you do at recess?" "Did you do any pranks?" "Who was your favorite teacher?" Cute. Of course, if she'd asked me for a kidney, I'd have cut it out right then and there. But neither her questions or my answers drew me back the way a Caring Bridge comment did a week ago, a note from dear friends up in Washington who are going through really tough times. Medical problems, real medical problems, have them holed up in a Seattle hospital, where, often as not, he reports, visitors stop by and sing. 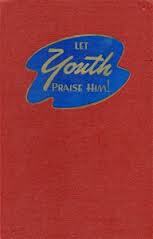 Here's what friend Ron wrote about a week ago: "Much of our singing continues to come from "Let Youth Praise Him," the songbook that so many of us grew up with in Christian school." Like me. I did. I know by heart the very tunes they're singing up there in that hospital room. "Those songs shaped us--shaped our theology and thus our lives," he wrote, and he's right. And then, "Revisiting them after these several decades has been a blessing." My granddaughter's questions were dear, trust me; but Ron's comments are haunting, in a powerfully sweet way, because as much as I would like to be up there singing them with my friends, I honestly don't have to be. I know well and dang good exactly what they're singing. I could sing along from a thousand miles east, and I don't even need a book. I can remember that dark red hymnal clearly, and I wouldn't be surprised if somewhere in this house there is still is a bruised up copy of Let Youth Praise Him. All the drama of "The Ninety and Nine That Safely Lay" will be in me forever, even though I don't know that I've sung that song since I was twelve. "Far and Near the Fields are Teeming," "Give, Said the Little Stream," "Humble Praises, Holy Jesus"--they're all there; and then there's the complete score of one-act play: "Master, The Tempest is Raging." I haven't seen nor sung those songs in fifty years, but I know 'em like the back of my hand, and I would have given most anything to be there in that hospital room, making music with our friends. There's just something about music that won't let go. The mother of a friend of mine lost most all of her faculties before she died. Dementia robbed her of most sense. But all her children had to do was sing her favorite hymns, and she was right there with them. I'm neither a Jesuit or a Marxist. I'm not sure anyone will ever know who--to be sure--made the claim that if you owned a kid to age seven, you'd have yourself a man. I don't even know if I believe it. I'm sure there are plenty of Christian school kids from the 50s who don't remember those sweet little ditties, nor care to. But, in my book, Ron is certainly right. Those kid songs are so deep in me that nothing could dig up the roots. And I do wish I'd been there with them because, when I think about those moments in that Seattle hospital room, I honestly can't imagine greater comfort, greater joy, greater love. This morning's thanks is for an old book I likely haven't held in my hands for a half-century, a kid's hymnal that will be, I'm sure, forever open in my heart, just as it is in the hearts of our friends. Each one of us is equipped by God and the Holy Spirit to serve Him and each other. Each of us carries a set of gifts that allow us to be our best. I believe that when we’re using our God-given gifts, we are glorifying Him. I remember as a teenager, I took a test full of multiple choice questions about how I respond to situations and how I prefer to act. After my answers were analyzed, I was told what my spiritual gifts are. When I looked over my answers, it was like reading a horoscope, except that everything was dead-on right. Please don’t think I’m endorsing horoscopes in any way. As I explored what spiritual gifts were and why God gave them to me, it was freeing and empowering. It made me appreciate and acknowledge my Creator in a way I never had before. He knew my personality and my temperament. He gave me gifts that compliment my personality and my likes and dislikes. Now I know why I enjoy doing certain things. And knowing that my Creator gave me these gifts obligates me to use them in a more powerful way. I am now motivated by Him to use my gifts and use them well. We are a unique community of believers who bring our children together every day. If we all brought our gifts to the table, I think we’d be amazed at what we could accomplish, all for His glory. 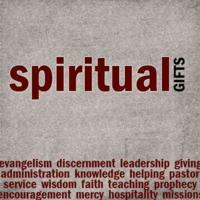 For a thorough list of all the spiritual gifts listed in the Bible and what each means, please click here. Imagine a day when someone else is in charge. Sounds great, right? Someone comes in to wake you up in the morning and decides what you’re going to wear for the day. Someone gets your breakfast ready (even though you really wanted to sneak some Fruit Loops for that needed sugar boost). Then Someone suddenly demands you to get your shoes on quickly because “we’re running so late!” After a ride in the car, you’re quickly brought into work with a hug and a kiss, and then Someone is gone. You soon realize that your lunch is still in the back seat, but hopefully Someone will notice and bring it to you. Okay, so I’m obviously taking the kid’s point of view here. Seeing life from their shoes can give some insight into the importance of routine simply because kids have very little control over their lives, especially the younger ones. I know from experience with my 3 year-old twins that they like to have some sort of control. They want to know what’s coming up next, and what’s expected of them. But sometimes I don’t even know what’s coming up next! I find that when I let them know what’s going on, where we’re going, how they need to act, and what they need to do, and then they are more confident and proud of themselves when they can fulfill their duties. And I’d like to think that confidence + pride = self-esteem! I had to read it a couple times to help it sink in (hey, it’s Monday). I know we’re all busy. There are sports events to attend, lunches to make, laundry to do, church to attend, bills to pay, groceries to buy, etc. 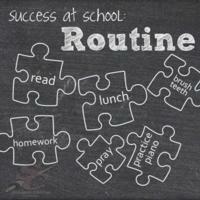 But for your child’s success at school, try to implement a routine. Routines eliminate power struggles because you aren't bossing them around. This activity (brushing teeth, napping, turning off the TV to come to dinner) is just what we do at this time of day. The parent stops being the bad guy, and nagging is greatly reduced. Routines help kids cooperate by reducing stress and anxiety for everyone. We all know what comes next, we get fair warning for transitions, and no one feels pushed around. Routines help kids learn to take charge of their own activities. Over time, kids learn to brush their teeth, pack their backpacks, etc., without constant reminders. Kids love being in charge of themselves. This feeling increases their sense of mastery and competence. Kids who feel more independent and in charge of themselves have less need to rebel and be oppositional. Kids learn the concept of "looking forward" to things they enjoy, which is an important part of making a happy accommodation with the demands of a schedule. He may want to go to the playground now, but he can learn that we always go to the playground in the afternoon, and he can look forward to it then. Schedules help parents maintain consistency in expectations. If everything is a fight, parents end up settling: more TV, skip brushing teeth for tonight, etc. With a routine, parents are more likely to stick to healthy expectations for everyone in the family, because that's just the way we do things in our household. The result: a family with healthy habits, where everything runs more smoothly. Now here’s the good part: Someone picks you up from work, lets you sit on the couch while supper is prepared. Before you know it, your favorite meal is on the table, and all you have to do is eat it. Now doing the dishes doesn’t seem so bad! Need more reading material? Please check out Success at School - Encouragement, Success at School - Communication and Success at School - Prayer.